Pear-This might need a newly invented vocab. Is lush-delish a word? Luciouslicious? A not too sweet fresh pear fragrance. It is so crisp and juicy! Mandarin Plum-A fat, juicy, ripe summer plum-punched up with a spark of mandarin orage! The earthy, delicate plum fragrance and the citrus of the orange combine to make a wonderfully sunny, fresh scent. 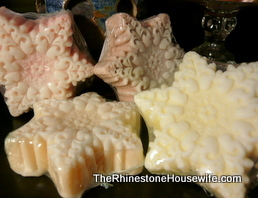 Stunningly detailed snowflake soaps, in a variety of winter scents. 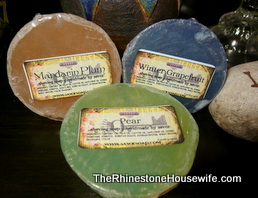 Please, please, please don’t miss out on these, they are the most decadent and gorgeous soaps I have ever seen! Cinnamon Snowflakes: Sweet, sugary, with a hint of cinnamon (not for sensitive skin). Pink. Satsuma: Bright citrus, mandarin oranges. Yellow. Angelico: Warm and inviting cocoa and hazelnut blend. Brown. 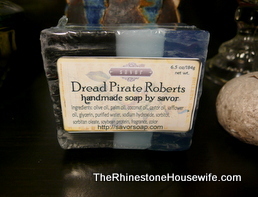 Dread Pirate Roberts is a big chunky bar scented with a warm blend of amber, freshly washed linen, a wisp of musk and a velvety finish. Great for both men and women. The coloring is inspired not only by the Man in Black’s outfit but also by his mysterious blue eyes — “eyes like the sea after a storm.” The bar contains a delightful blue shimmer, giving this bar a complexity and richness that match the scent. 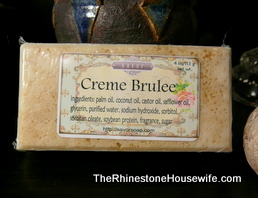 Creme Brulee is a slighty custardy, caramelly, gentle and creamy scent, with a velvety richness you find in a decadent dessert. This is one of Savor’s top-sellers! Everyone who has tried it remarks on the delicious and unusual scent. Ingredients: There’s no added coloring to the bar — just rich, golden sugar for the topping. The sugar is organic and vegan. 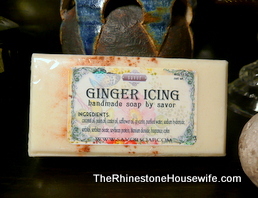 The spicy cinnamon in this scent might not be suitable for all skin types, especially for sensitive skin. PreviousHottie’s Hot Product Pick Of The Week!